Who says you can’t have pizza for breakfast? 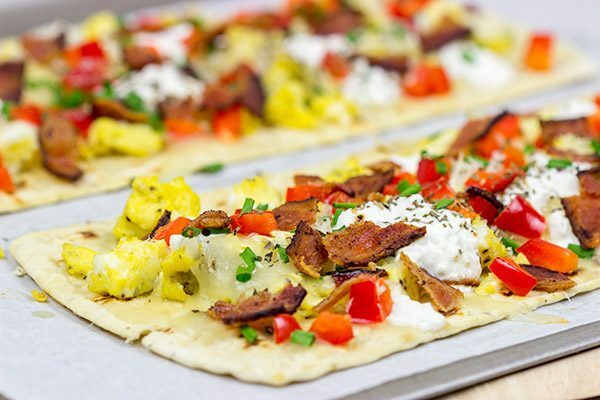 This Thin Crust Breakfast Pizza is a great way to start the day! I enjoy watching the Tour live. (I suspect that’s because I’m too wiped out to stay up and watch the recap show each night.) But the problem is French time is 6 hours ahead. So that means the live coverage on most days starts around 6 or 7am. I’m an early bird, so I’m ok with that. I just sit down with my computer and get to work. But multi-tasking like this requires tasty breakfasts, like this Thin Crust Breakfast Pizza…but more on that one in a bit. Before I leave the Tour de France talk, I need to call out one of the more unusual traditions of this great bike race. And it has nothing to do with the actual race. Instead, it has to do with the fans. Or one fan in particular. The Tour de France Devil. No matter the day or weather, fans line the sides of each day’s course to catch a glimpse of the Tour as it passes. Some fans wear crazy costumes and run alongside the riders for a short distance. That’s part of the fun of the Tour. But then starting in the early 90’s, one German cycling fan took it to a whole new level. He dresses as the Devil, complete with pitchfork and crazy white beard. And he leaps around like a madman when the cyclists pass. He shows up somewhere on the course almost every single day…and he usually marks his location with a large pitchfork painted on the road. Over time, he’s become a Tour de France fixture. An unofficial mascot of sorts. As I mentioned above, I usually eat breakfast each morning while watching the Tour. Normally it’s a bowl of cereal or yogurt + granola, but we’re now in the homestretch of this year’s Tour. That meant I needed to step up my game a bit this week. So I grabbed some Flatout Artisan Thin Crust flatbreads and made a breakfast pizza. Who says you can’t have pizza for breakfast?? Instead of pepperoni and jalapenos (my go-to pizza toppings), I went with scrambled eggs, bacon and bell peppers. And this Thin Crust Breakfast Pizza was amazing! 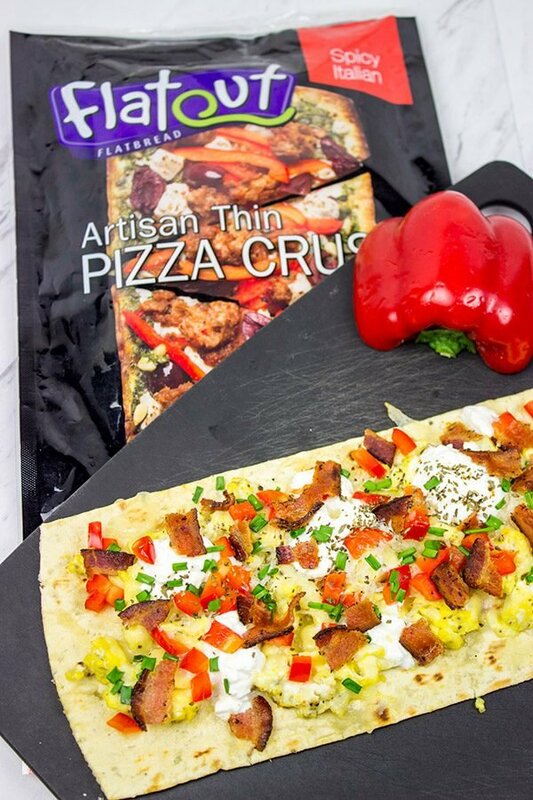 We always keep Flatout flatbreads in the pantry, and we typically use them for wraps, taco bowls or even dessert. But I’ve never used the flatbreads for breakfast. At least not until this Thin Crust Breakfast Pizza showed up! Aside from cooking the bacon, these pizzas were a cinch to prepare. 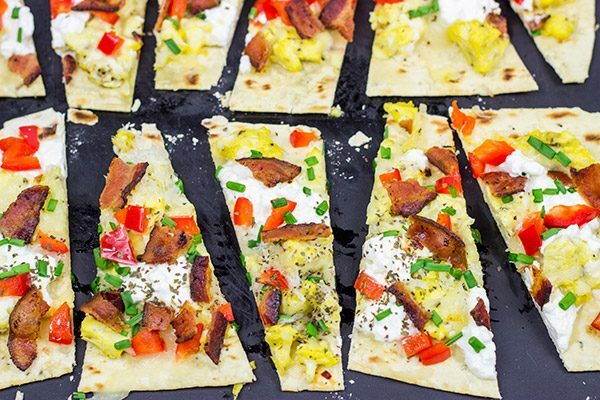 Just scramble the eggs while you pre-bake the flatbread. Then pile all of those delicious breakfast toppings on top and toss the flatbreads back into the oven for a few minutes. And *boom* you’re done. Have a great weekend everyone, and make sure to catch the end of this year’s Tour on Sunday morning. I’ll be watching…with a Thin Crust Breakfast Pizza and a mug of coffee. Cheers! While oven is preheating, cook bacon in a large skillet until crispy (~8-10 minutes). Transfer to a paper-towel lined plate and pat dry; set bacon aside. In a medium bowl, whisk together eggs, pepper and salt. Lightly scramble eggs in a large skillet over medium-low heat; set scrambled eggs aside. Place flatbreads on baking sheet and brush with olive oil; bake at 350°F for 2 minutes and then remove from oven. 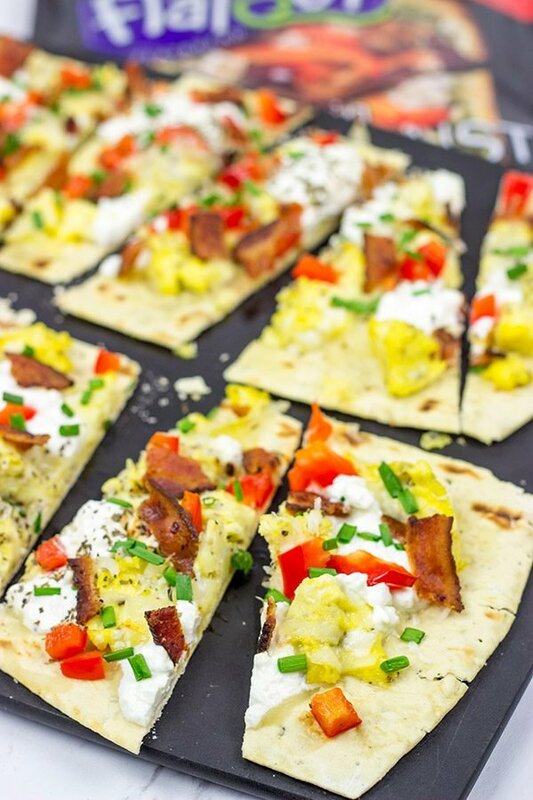 Top flatbreads with scrambled eggs, mozzarella, Parmesan, cottage cheese, red bell peppers and dried basil. Crumble cooked bacon and chopped chives on top of flatbreads. Return flatbreads to oven and bake at 350°F for 4-5 more minutes, or until mozzarella has melted. This Thin Crust Breakfast Pizza post was sponsored by Flatout Flatbread, but the recipe and opinions are entirely my own. Thank you for supporting the brands that support Spiced! Than fan or unofficial mascot sure is funny! Have never seen that before! What a character! Pizza for breakfast? Whoever said no to that? Certainly not me! Love how this is so quick to put together. Those Flat out flatbreads are so convenient! Have a lovely weekend, David! Seriously…the guys seems like he might be half-crazy. But then again, he does get to spend 3 weeks in the French countryside each year…so maybe he’s not all that crazy! And yes to pizza for breakfast! I mean, I’m ok with cold leftover pizza, but hot pizza with bacon and eggs is way better any day of the week! Thanks, Jessica! 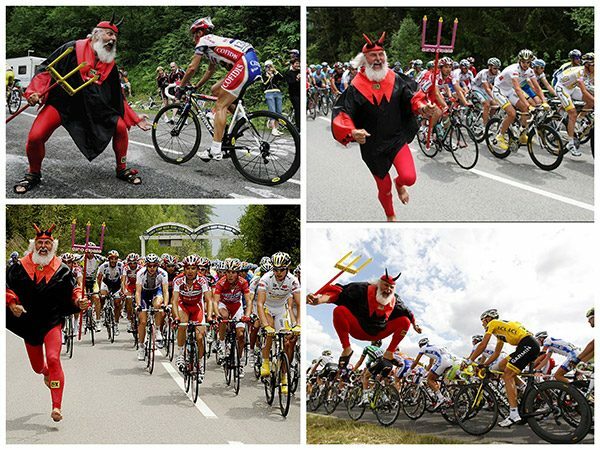 And yes, that Tour de France devil is one wacky guy. And I kinda want to be him when I grow up…whenever that is. Thanks, Kevin! Hi David! 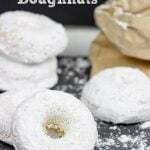 Now this is my kind of breakfast (even though I’m really not a breakfast person)! But, I’d certainly have it for brunch a little later! You know you had me at bacon and thin crust is always my choice for pizza…more toppings, less crust! Have a great weekend! Yesssss I too have been carrying the iPad around the house to watch the Tour. I’m thrilled to report baby G can nap through the coverage :p My dad was a professional cyclist so cycling is a BIG deal for us. Have you gone to see the Tour in person? In 2002 it began in Luxembourg so we went to view the prologue, ITT, and to visit our cousins. It was AMAZING. I thought I read a few years ago teams began sponsoring Senft so that he could still come and spectate? 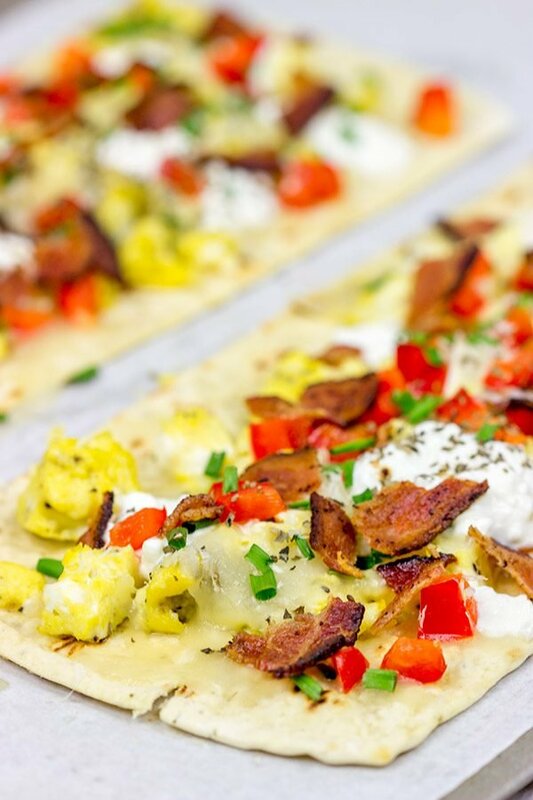 This breakfast pizza sure would make getting up a lot more enjoyable! We’ll try it soon! Yesss…another Tour fan! Wait. Holy cow. Your Dad was a professional cyclist? Would I know him?? I’ve been watching the Tour every year religiously, and then I try to catch some random bits and pieces of the other grand tours. (It’s hard to find coverage of those here in the States…either that, or I just forget to look.) We haven’t been to see the Tour in person, but I keep telling Laura every year that I want to go see it. The only strange thing is it feels like a lot of prep time to see the guys fly by you in ~30 seconds or so, ya know? I haven’t heard about anyone sponsoring Senft, but it makes sense. I read an interview a couple of years ago that said he was out of money and his health was bad, so he was retiring from the Devil. But I’m pretty sure I’ve seen him a couple of times this year still…who knows! Also, watching the Tour and eating breakfast pizza = perfection! Enjoy that last stage today! 🙂 Thanks, Lauren!! My dad raced road in the 70’s in the States and the 80’s in Japan where he switched to track cycling. I believe he was the first American to race track in Japan. Currently, he helps sponsor 2 races in June in Virginia with the Air Force. If you do go spectate I highly recommend an ITT because you get to see so much more. A cyclist goes by every few minutes and the motorbikes do tricks if there isn’t anyone nearby. The caravan ahead of the race is a sight to see. I never thought old ladies would jockey for free sausages thrown from a caravan but there you go 😉 I also met someone who did the Champs Élysées and said it was amazing because the peleton goes by so frequently. That’s my next goal! The post-Tour letdown is real but there’s always the Olympics and the Vuelta! And yes, on to the Olympics and the Vuelta! I usually turn my focus to college football by that point, so I’ll have to see if we get tv coverage of the Vuelta here…I sure hope so! Pizza for breakfast you say? I am totally on board with this! Pizza at any time of the day! I think the Tour De France is incredible too. Did you see about that section that was over run by alpacas or goats or something, as the farmer let them loose off the mountain side. I missed the alpaca/goat invasion, but I did see the wild mountain goat perched on the side of a mountain watching the tour go by. Such stunning scenery over there…I think that’s half the fun of watching the Tour each year! sarvesh will go crazy for this pizza, because he loves thin crust! sounds amazing David, hope you guys had a wonderful weekend! Rod loves watching the Tour de France. I just catch a few highlights here and there. I’m going to have to watch for the devil….what a character! 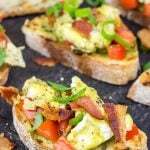 I’m all about breakfasts and pizza for breakfast is right up my alley! And there’s no doubt the kids would love this too! That sounds like me and Laura…I watch the Tour from start to finish, and Laura ducks in here and there and watches parts of it with me. Usually she shows up for the finishes…but that’s ok by me! I didn’t think about the kids angle here, but you’re right Kathy! Kids would love eating pizza for breakfast…heck, adults would, too! 🙂 I hope you guys had an awesome weekend! Uh … no one in my house has ever uttered the words, “You can’t have pizza for breakfast.” They’d go hungry on many days if they did. Having said that, I’m happy to add a breakfast-specific item to my pizza-for-breakfast roundup! Hah! Tell me about it. Pizza is fair game all day, erry day around our house. I have no problem with cold, leftover pizza for breakfast…but I gotta say the breakfast toppings were a huge hit. 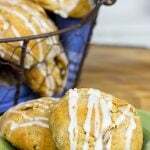 I could even go for this one for breakfast-for-dinner sometime! I’m a big fan of breakfast pizza and thin crust is my favorite. However, I’m not an early bird…but this pizza sounds perfect for lunch, or dinner.